1. 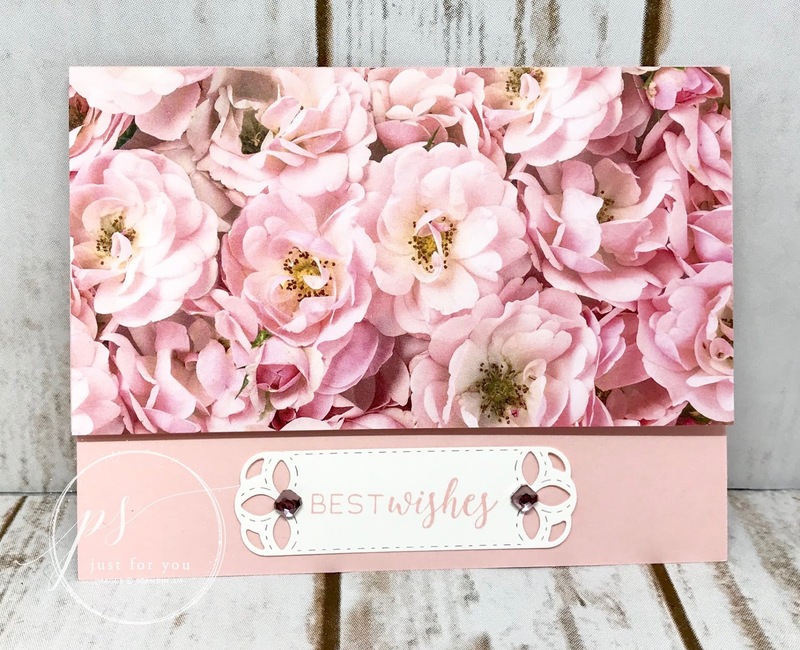 Stamp the words “Best Wishes” in Blushing Bride ink on the smallest piece of Whisper White cardstock. 2. Stamp the words “Enjoy your special day” in Blushing Bride on the larger piece of Whisper White cardstock. 3. Cut out the two stamped greetings with the Stitched Labels Framelits. 4. Fold the card base on the scored line. Adhere the Petal Promenade Designer Series Paper to the card front with SNAIL adhesive. 5. Adhere the die cut white piece with the “Best Wishes” on to the lower portion of the inside of the card with SNAIL adhesive so that it shows when the card is closed. 6. Adhere larger die cut piece on the inside of the card near the top so that it does not show when the card is closed. 7. Adhere two Petal Pink Rhinestone Gems on each end of the Best Wishes die cut label. 8. Give this card to someone on their special day!